Max hit ~3,500; enrages (does NOT rampage or flurry); partially slowable; summons; average resists; fights to the death (does not run at low health). This page last modified 2008-09-03 10:19:46. To shed some light on this guy, and the camp. His AE is conical, so positioning can allow only the tank to be hit with it, overall, not a big issue. around the +600 +375 +550 loc, he can spawn in 1 location in that room. which is roughly +610 +357 +549, and the PHs are either 'a weed eater' or 'a steamwork shock striker'. The PH/named is a static spawn, and not too hard to pull w/ SK or MNK. I have also seen him spawn in the other pod, roughly +455 +465 +550, in place of the wandering mob in this pod. PHs Ive seen are 'a weed eater' and I think one of the caster gnome models (torturer or flamemaster). Belchforth himself, is a pushover. max hit 3k, but its slow, immune to snare/root, BST slow did land partially. Overall a quick fight to disc through. Worthy of comment, is Cotongle, the other named in the first pod, his PHs is the wandering 'a gardener'. He is a pita, 2 'a weed eater' spawns, and he just gets in the way of pulls and whatnot, so keep an eye out. Ah yes, another SoF named with inaccurate information. Having just downed this mob tonight, I'll contribute the info I collected. I found him inside the furthest NW enclosed garden on the third floor. His location was +603, +378, +549. Our tank was a level 80 monk with max defensives, 3400 AC, 91 avoidance, 17% shielding, improved block III, improved dodge III, 8% dodge mod. Max melee hit was 3013. Average melee hit was 1371. He put out 1046 DPS during the fight. Casts Spray of Filth on a semi-regular basis (he cast it 7 times during a 3 minute fight). It is a directional AE, and so we aimed him into a corner, and it just landed on the tank. The parses shows his total HP to be almost exactly 200k. Was social with the other mobs around him. No rampage, AE rampage, flurry. Doesn't run on low health. All in all, Belchforth the Unclean is a pretty easy mob for Fort Mech, and shouldn't give you too many problems. Thank you for the information provided. I just want to clarify the location. Is it the furthest North West most garden or North East most garden. The /loc given above is an exact spawn point in the furthest North East garden, not the furthest North West garden. I just want to be sure I am hunting the right placeholders. HIts for about 5k... Slowable.. Spawned for us in one of the rooms on the first level of the fortress. Has a blob model. Max hit appeared to be 5211. Has a frontal AE called Spray of Filth. Casts it very often. 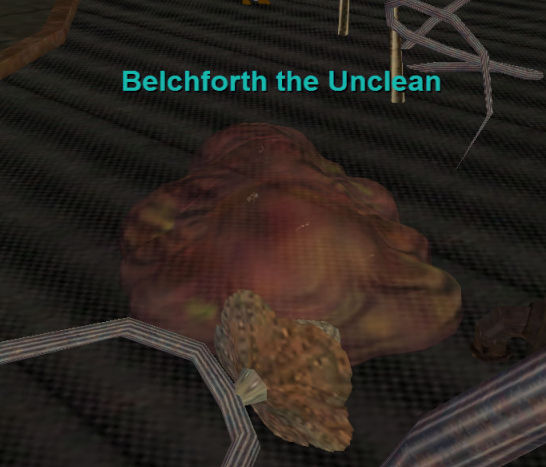 The name of this mob is "Belchforth the Unclean"